Bullet resistant guard booths are a crucial safety feature for any secure facility. Whether you require a perimeter security building or an access control point booth, bullet resistance will bring much needed peace of mind. At Shelters Direct, we are a leading supplier of bullet resistant guard booths for a wide range of applications. Learn more, below. Bullet resistant guard booths are useful for a wide variety of applications. Bullet resistant guard booths can be customized with a range of options to suit the unique needs of your facility. Whether you require a full HVAC system to keep employees comfortable through inclement weather or prefer tinted glass, Shelters Direct can fabricate a guard booth that is designed to suit your purpose. We are able to outfit bullet resistant guard booths with features such as gun ports, sliding or swinging glass doors, built-in restrooms that meet all ADA requirements, and intercom devices and security flood lights. We can handle Level I to Level VIII polycarbonate laminated bullet resistant glass clad which can be tinted or outfitted with reflective glass film. All of our prefabricated booths meet UL752 requirements and while we don’t offer NIJ models, we can generally offer a comparable UL752 that will suit your needs. We have extensive experience fabricating guard booths for a wide range of industries and can create a model that will incorporate any and all of the features that your facility requires to stay safe and secure. 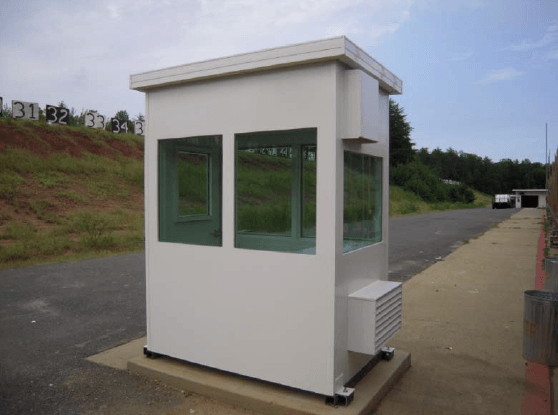 We recently completed this bullet resistant guard booth at the Quantico Firing Range. From military facilities to land points of entry, bullet resistant guard booths are useful in a wide range of applications that call for enhanced security. 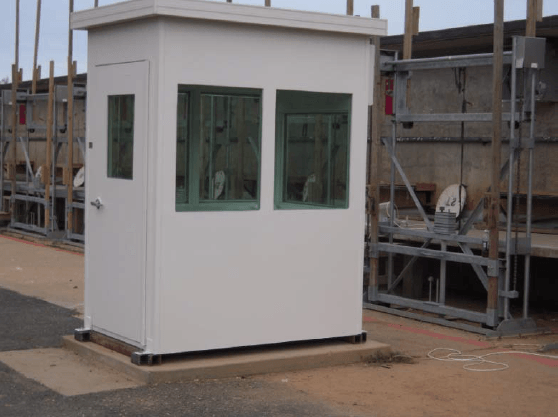 Some of the most common applications for these booths include guard shacks, military guard booths, perimeter security buildings, entry and access control, parking control, wastewater treatment plants, and overwatch booths. No matter the application, Shelters Direct will be able to supply the right booth for the job. Shelters Direct installed this bullet resistant guard booth at the National Institute of Health. For over 15 years, Shelters Direct has been a trusted source for the supplying and installation of bullet resistant booths as well as canopies and shelters. We work with a wide variety of clients throughout the United States and abroad to provide quality products and expert installation so you can be confident that we will get the job done right. Interested in learning more? Contact us today! And don’t forget to keep up with us on Facebook, Twitter, Google+, Pinterest, and LinkedIn too. This entry was posted on Friday, February 26th, 2016	at 10:01 am	. You can follow any responses to this entry through the RSS 2.0	feed. Both comments and pings are currently closed.